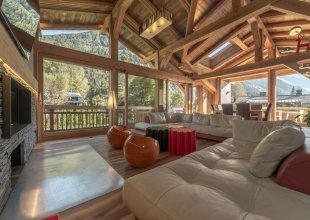 Baby Bear is located in a private and scenic setting in the hamlet of Les Bossons in the Chamonix Valley. You can access the Brevent/Flegere and Les Houches ski lifts or the centre of Chamonix in just a 10 minute drive from the chalets. 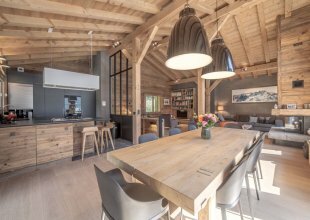 Picture perfect and so cosy you may never want to leave, Chalet Baby Bear provides the ideal romantic getaway or family break. Baby Bear sleeps up to six guests in three delightful bedrooms with en-suites. Enjoy stunning views from the wonderful living and dining areas and from the spacious terrace. The chalet also boasts a superbly equipped modern kitchen. Its three double en-suite bedrooms combine a traditional chalet feel with luxurious design and finish. Enjoy a well deserved rest in the chalet outdoor hot tub, situated on the ground floor private terrace. Snuggle the kids up in front of a movie in the cinema room while you enjoy the sauna. Situated just a stones throw away from Amazon Creek, the two properties can be rented together fully catered for a party of up to 16. Chalet Baby Bear is offered on a self-catered basis, with an early morning delivery of fresh bread and pastries and a welcome hamper pack with essentials including a bottle of Champagne. 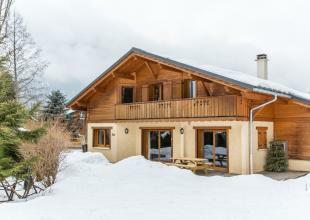 Prices are based on 4 guests having exclusive use of the chalet including daily bread and pastry delivery. Additional 2 guests can be accommodated for an extra charge. A catered package is available on request, please enquire. 2x King size bed or Twin bedrooms with en-suite bathroom with bath/shower room. From one room you can access the outdoor terrace, hot tub and garden. 1 x King size bed or Twin bedroom with adjacent shower room. Arrival meet and greet with Amazon Creek staff. Dedicated service from our professional resort manager and team. Welcome 'essentials' pack, a bottle of champagne, local wine, cheeses, jam and charcuteries. Daily delivery of fresh breads and pastries each morning. Private resort driver service. (8am-11am and 3pm-8pm). Driver service outside of these hours is available upon request, until midnight).